Disasters can happen any time of day, any time of year, and it’s impossible to protect your property from all the potential damage they can bring. Mold, floods, fires, and storms cause different types of destruction and it’s important to begin the remediation process quickly before your property is beyond restoration. ServiceMaster Restoration & Cleaning has been providing a wide range of disaster restoration services to residential and commercial clients in Porter, TX for 25 years. Our expert technicians are fully certified by the IICRC to deliver high quality restoration services that meet the strict standards of the ServiceMaster Restore Quality Restoration Vendor Program. We use only the most advanced cleaning techniques and equipment in the industry to guarantee we can provide the best restoration services to our clients. 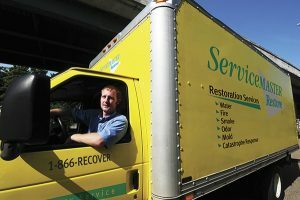 At ServiceMaster Restoration & Cleaning, we not only work with homes and businesses in Porter, TX, but we take part in large commercial restoration projects and community-wide disaster support during times of crisis. This dedication to excellence and quality service earned us the Super Service Award from Angie’s List and the Better Business Bureau has given us their Award of Excellence three times. Water damage restoration. No matter how excess water gets into your home or business, it seeps into porous materials like drywall, insulation, and wood. The materials warp and discolor and help the water spread further into the building, causing more damage as it goes. Mold growth begins within days and adds to the damage while introducing the risk of health issues. Left untreated, the water and mold will eventually rot building materials and they can collapse, turning a small restoration into a larger one, or even into a complete demolition in an extreme case. ServiceMaster Restoration & Cleaning can remove excess water and moisture from your home or business and make any necessary restorations and repairs before further damage can occur. Fire damage restoration. Fires are the most dangerous disaster because they move quickly and pose the most serious risk to physical safety. Never try to fight a fire on your own; evacuate people from the building and call 911 from a nearby location. The damage to property doesn’t stop once the flames are out. Toxins from burning synthetics, chemicals used to fight the fire, and smoke will continue to damage household surfaces and content until restoration begins. The professionals at ServiceMaster Restoration & Cleaning have years of experience in cleaning, restoring, and rebuilding homes and businesses after fires of all sizes. Mold remediation. Mold is a difficult problem because it’s dangerous to clean without proper training and equipment. The best course of action is to call for professional remediation at the first sign; there may be more mold in hidden places, like the interiors of walls. Mold grows quickly in areas with excess moisture because the spores are everywhere in the air. They cause a great deal of damage to both building elements and property, and cause health problems in people. ServiceMaster Restoration & Cleaning is licensed by the State of Texas to provide comprehensive mold remediation services to commercial and residential clients, including testing to find hidden mold. We find mold in hidden places and remove all traces so the building is safe to occupy again. Smoke and odor mitigation. Disasters often leave bad smells behind. Floods, sewage backups, fires, and other catastrophes cause odors that are difficult to remove, and even more difficult to live with, so it’s important to clean them at the source, not cover them with air fresheners or fabric refreshers. ServiceMaster Restoration & Cleaning provides smoke and odor mitigation for your home or business no matter what is causing the smell. Our advanced techniques and equipment ensure that we remove the smell and the original source, not cover it up. Any time you need disaster restoration services for any reason in Porter, TX, call the trusted, highly trained professionals at ServiceMaster Restoration & Cleaning. We’ll respond quickly to the emergency to limit the damage and work with your insurance company to process your claim quickly and get your life back on track. Call the highly trained experts at ServiceMaster Restoration & Cleaning 24 hours a day, 7 days a week at (800) 303-5844 for emergency disaster restoration services.